The cut-out Chocolate Mini Chip Holiday Cookies are dotted with mini chocolate chips and topped with frosting and a drizzle of melted chocolate for a special treat. Fun to make with kids. BEAT butter, brown sugar, granulated sugar, vanilla extract and salt in large mixer bowl until creamy. Beat in egg yolk. Gradually beat in flour. Stir in 1 ½ cups morsels. Divide dough in half. Cover; refrigerate for 1 hour or until firm. ROLL half of dough to ¼-inch thickness between two sheets of wax paper. Remove top sheet of wax paper. 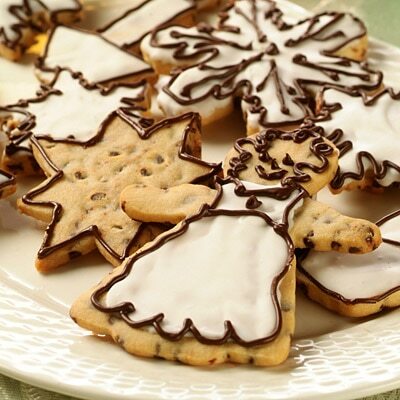 Cut dough into shapes using cookie cutters. Lift from wax paper; place on ungreased baking sheets. Refrigerate for 10 minutes. Repeat with remaining dough. BAKE for 9 to 11 minutes or until golden brown. Cool on baking sheets for 2 minutes; remove to wire racks to cool completely. Spread with frosting; pipe with melted chocolate. TO PIPE CHOCOLATE: Place remaining morsels in heavy-duty plastic bag. Microwave on HIGH (100%) power for 45 seconds; knead. Microwave for 10 seconds; knead until smooth. Cut tiny corner from bag; squeeze to pipe chocolate.